Even though David Luiz commits the odd rash error due to his propensity to overcommit, which is typically criticised harshly, there’s no doubting what a quality operator he is. 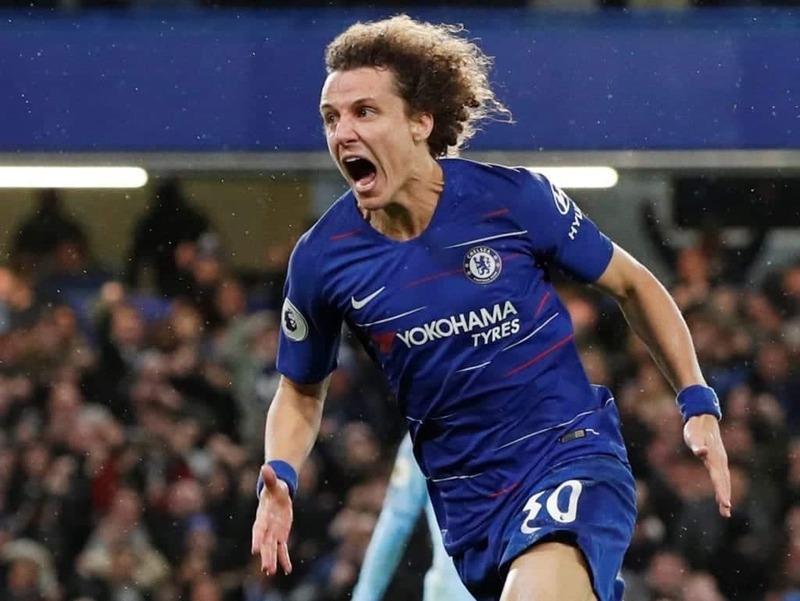 After a tough week for Chelsea, Luiz emphatically reminded his doubters to take some time to focus on the many excellent things he does by putting in a superb shift vs. Pep Guardiola’s sensational Manchester City side. From the outset, the 31-year-old was a commanding, forceful and intelligence presence on the left side of Chelsea’s central defence alongside Antonio Rudiger. Hardly making an error throughout the 2-0 victory, the Brazilian undertook his defensive work admirably, as he exhibited high levels of concentration, awareness and tactical acuity. To start with, the way he tracked the runs of his opposition, be it down the middle or into the channel behind left-back, Marcos Alonso, was influential in halting their attempts in exploiting these spaces. 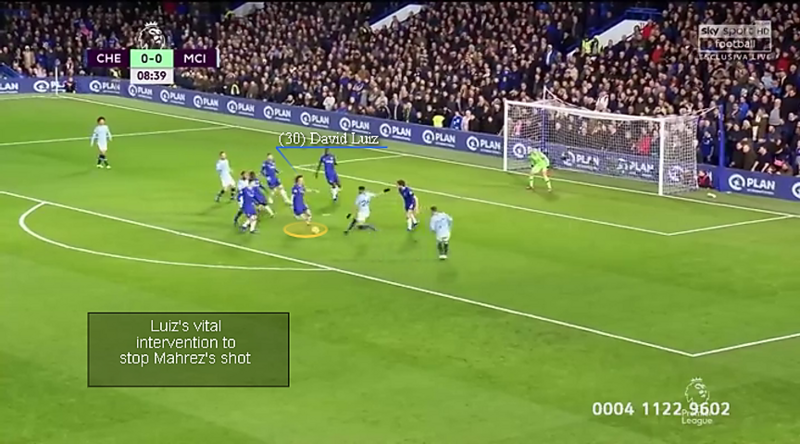 With Man City initially deploying Raheem Sterling upfront, the speedy attacker targeted the channel often, and it was great to see Luiz remain so alert to persistently nullify his opponent. In addition, seeing as Riyad Mahrez and Bernardo Silva would rotate and angle runs into these half spaces, he importantly cut them off suitably too. 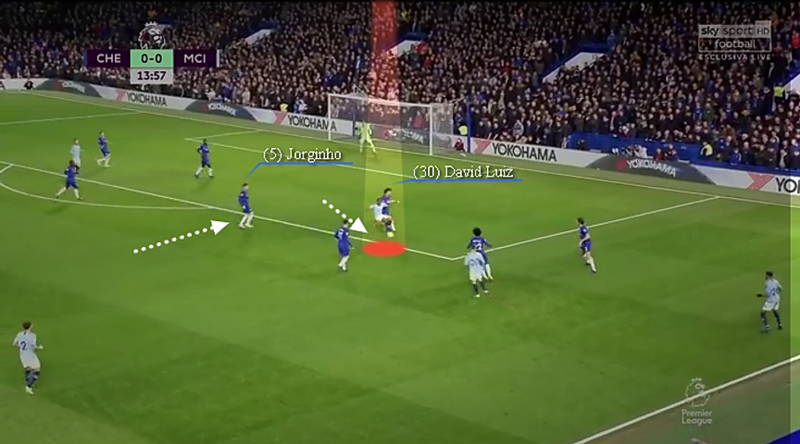 Vitally, when he did vacate his central station, Jorginho would drop back and cover so a large opening in the middle of the Blues’ defence didn’t open up. 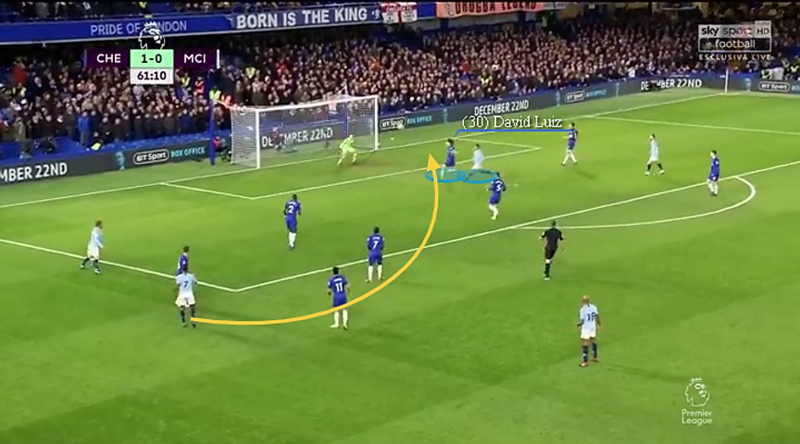 Luiz did a neat job of dealing with crosses and cutbacks too, where he’d constantly scan his surroundings and adjust his positioning to be situated ideally to cut out balls from wide. What’s more, by picking up the ball trajectory rapidly, he reacted quickly to alter his body posture and get across to meet the ball ahead of his foes. While it obviously helped being taller and stronger than the more diminutive Sky Blues attackers to win aerial duels especially, his judgement and anticipation deserve mention. 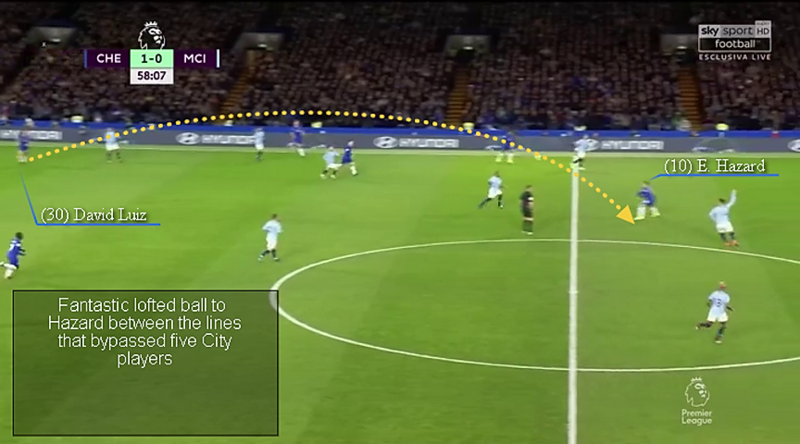 Another key to Chelsea successfully keeping a clean sheet against the gifted Man City frontline came from how the home side kept their organisation and spacing adequately. And Luiz played his role brilliantly. Timing when to step up, drop back or shift horizontally in synchronisation with his backline, the unmistakable stopper’s decision making was right in line with his partners to make life as difficult as possible for them to be broken down. When a pressing trigger presented itself like Sterling checking deep with his back to goal or in an open body orientation, he made calculated calls, that are never without risk, when to spring forward and attempt to try force a turnover or stop his adversary from enjoying time or space to turn and dribble. Despite sometimes being slightly late with his harrying actions, his aggression and proactivity to look to win back the ball was fantastic to observe when certain conditions to do so arrived. Executing his interventions with precision and handling 1v1 battles with aplomb, the fact he won 5/5 aerial duels, all of his four tackles, made eight interceptions and chimed in with 12 ball recoveries aptly demonstrated his super stopping efforts. 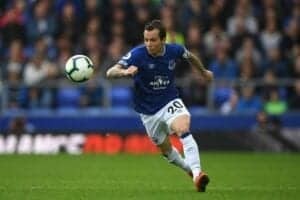 Although he wasn’t as involved as he usually is in possession, as a result of City having a large chunk of the ball, he still contributed wonderfully in Chelsea’s attacking forays. Displaying his tremendous range of passing over short, long and intermediate distances, he often bypassed the opposition’s first line of pressing and midfield with some pinpoint deliveries. 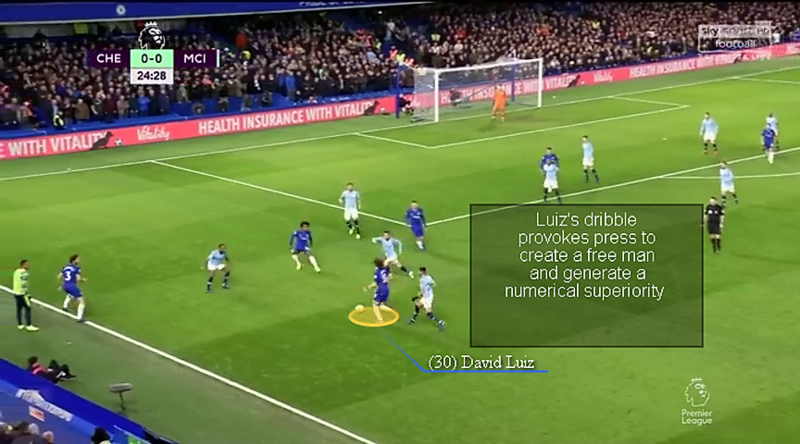 Hitting his passes with accuracy, firm weighting and with either foot, Luiz was instrumental in Maurizio Sarri’s desire to build out from the back in the face of City’s high pressing. So comfortable on the ball and seemingly unfazed while under heavy pressure, he notably still made his passes with assuredness. A testament to his aptitude in this regard came when his raking 60 yard ball to Pedro proved the catalyst for the move that culminated in N’Golo Kante firing Chelsea into the lead in the 45th minute. Other noteworthy aspects of his offensive output came from how he’d spread wide to stretch City’s first line of pressing to help create a 4v3 superiority and via his probing forward dribbles that effectively provoked a City midfielder to press him, with this subsequently manufacturing a free man behind the presser. In a match where he embarked on two dribbles, played one key pass, completed 50 passes at an 86% clip and even capped off his exhibits with the sealing goal, Luiz impressively silenced his critics. After the game the former Benfica and Paris Saint-Germain star addressed the media, making a point of responding to the negative appraisals of him, insisting: “I know what it means to play for a big club. Big clubs it’s like that: if you win, everything is good. If you lose, it’s your fault, especially defenders and goalkeepers. Bouncing back in fitting fashion, Luiz will have gained plenty of confidence from his starring performance against one of the premier outfits in Europe. With Chelsea about to head into the busy Christmas period in the Premier League, one they’ll be expecting to take many points from in their matches with Brighton & Hove Albion, Leicester City, Watford, Crystal Palace and Southampton, Luiz will be pivotal in their quest for maximum points. Amid all the harsh words said about him, his latest accomplished outing might not change the minds of his doubters, but it did, however, serve as yet another reminder why a player so brave and bold as Luiz should be celebrated.